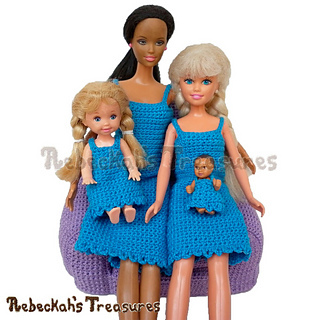 Simply Bluetiful a beginner’s crochet dress series for fashion dolls… The third in this series is designed to fit the 9 3/4” teen fashion doll by Mattel called Skipper. Worked from the top-down in mainly single crochet stitches, this simple pattern can easily be customized to be whatever you want it to be. Whether you make a simple tee, a beautiful dress or add your own flair to the skirt of the dress, you’ll soon have a new simply bluetiful dress to add to your collection!